I’ve been a bit spoilt with my USA travels this year. In fact, I’ve spent nearly a month over the pond in total, explored five states, six cities and three national parks, while also making a little foray into Eastern Canada too. 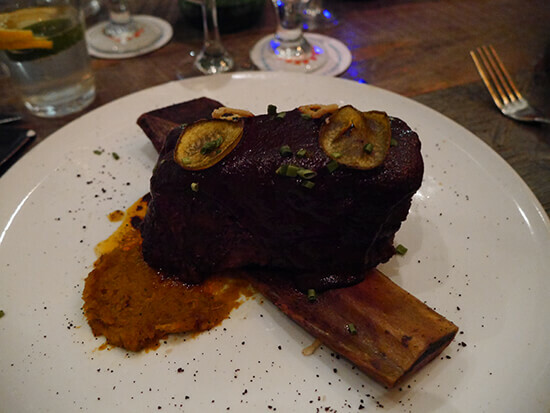 And, naturally, all that travelling meant a whole lot of food – something that they’re pretty famous for Stateside and thus something I couldn’t undertake half-heartedly. WHY? Melt in the mouth and made in the home of barbecue, how could I not fall in love with the rib at this Tex-Mex-style eaterie? The mole sauce on top was a bit too tangy for my liking, but the meat was cooked for hours upon hours, to ultimate perfection. WHY? 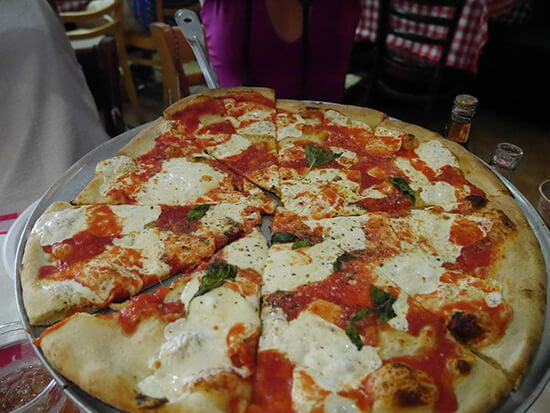 This Brooklyn landmark is a pizza legend for a reason – the Neapolitan flavours are authentic, with that hallmark charcoaling on the base. Read more about my love of this particular pizza here. WHY? We queued for an hour to get a spot in Mensho, as the locals couldn’t stop raving about it. 20 minutes after sitting down, we found out why. 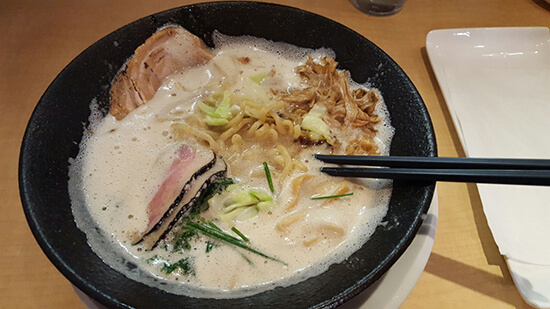 Move over Wagamama, packed with meaty flavours and a heady helping of spice, this was noodle soup at its very best – for all we knew we could've been eating tori paitan in the very heart of Japan. WHY? The curry here is delicious, whatever you get (the bhujia – vegetable fritters – are a great side dish), but come here for the atmosphere. 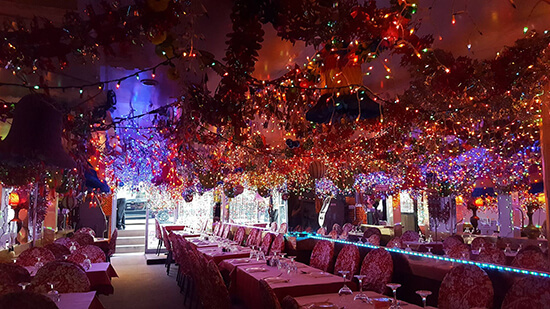 Surrounded by illuminated chilli peppers and fairy lights aplenty, this place is really something special – I went for my 27th birthday and adored it! WHY? America is great when it comes to getting a good patty, but few places do gourmet burgers quite like Bernie’s. Once a food truck offering and now a Houston institution, here you can get burgers with all the trimmings – and I really mean all – not to mention fries loaded with every topping you could want. I opted for the Homeroom burger (cheddar cheeseburger, crispy bacon, tipsy onions, chipotle aioli and a fried egg) and the Lunchlady fries (chips topped with slow-cooked beef, cheese curds, cheddar, gravy and spring onions). Suffice to say, I could only manage half. WHY? 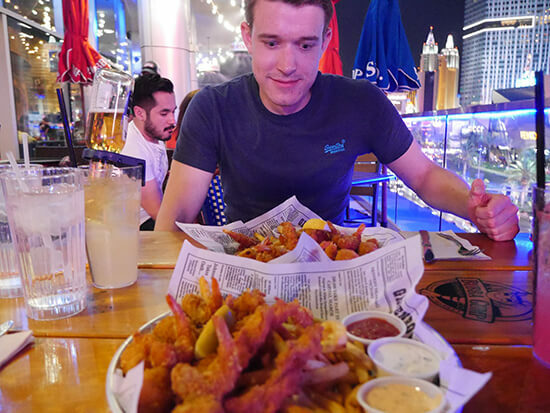 I wouldn’t normally recommend chain restaurants when travelling, but in Vegas where food and drink can be costly, not to mention you’re faced with an overwhelming paradox of choice, this Forrest Gump-themed joint suited us down to the ground. The food was fresh, filling and delicious (my fiancé and I both gorged ourselves on Forrest’s Seafood Feast), and, because we opted for outdoor seating, we had an uninterrupted view of the Strip below. WHY? 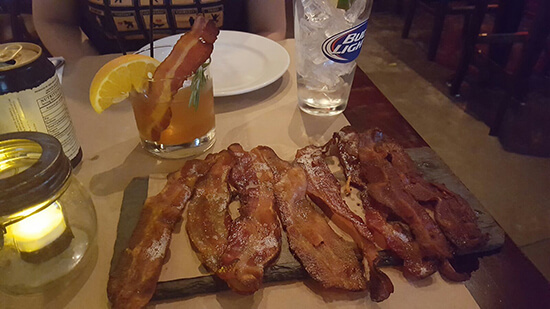 If you’re a fan of bacon, this is the best place in Hell’s Kitchen. You can have cocktails garnished with crispy bacon, bacon tasting platters (like the one we had above), bacon in your burger, and even bacon-infused desserts. It’s bacon overload and, quite simply, delicious. WHY? When you’re staying somewhere that sits atop the Gulf of Mexico, you’d be mad not have some fresh catch. 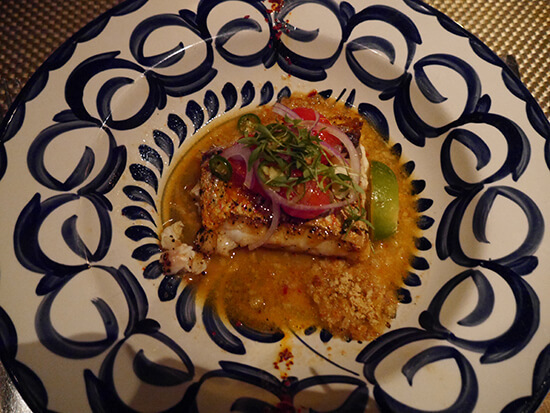 Bathed in garlic, red onion, cilantro and bacon breadcrumbs, this was quite possibly the best red snapper I’ve had. Ever. Hungry for some hearty US fare? Book an appointment with one of our Travel Experts today, and they'll tailor make the ultimate USA Journey to suit you.